This page also works as my disclaimer that I am not actively promoting to you (a foreign traveler) to use your phone or wireless-capable electronics in Japan and that you’re on your own in terms of the responsibility and risk of using your wireless-capable devices there. I wish I did not need to say this, but there’re enough number of “negative” people against this matter, so I have to say this and prepare this article in the beginning. or anything that “transmits” radio signals to the air. A Giteki sticker may be placed at the back of the device, or inside the battery compartment if the device is tested and certified to be conforming to the Japanese standards or specifications. They are almost the same models of iPhone 5S/5C except cellular frequencies. WiFi are the same, and Bluetooth are the same. Yet, it is legal under the Radio Act to use a Sprint or Docomo or Softbank or KDDI au iPhone 5S/5C in Japan, BUT it is illegal to use any other iPhone 5S/5C in Japan UNLESS you use it in Airplane mode and no WiFi/no Bluetooth. That’s funny, you ask. Well, it costs more than 5,000,000 Yen (about 50,000 US dollars) to have each model of the devices tested for Japanese market, I heard. And, Apple never bothered to test the sub-models of iPhone 5S/5C which they never intended to sell in Japan. 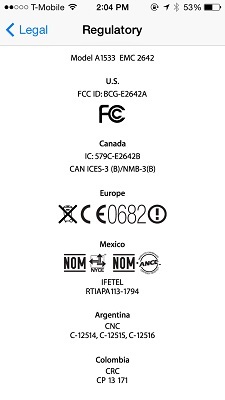 “But, how about FCC (in USA) and CE (Europe) certifications?”, you ask. Unfortunately, the current Japanese law does not recognize any test that is not conforming to the Japanese technical specifications, which they claim to be slightly different from other countries’ ones, like the strength of radio signals permitted. 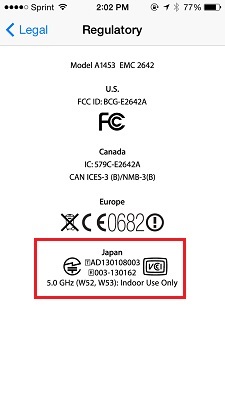 So, the test must be carrier out for the very specific and unique Japanese standards, not FCC nor CE. Sorry, folks. 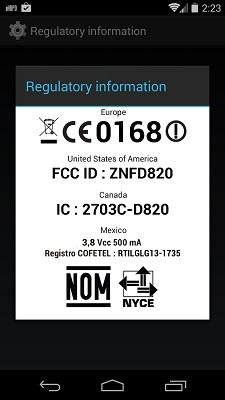 Here’s another screen shot from a Nexus 5 US model, in the Settings -> About phone -> Regulatory information. It does not contain a Giteki mark. If your cellphone, tablet, mobile WiFi router, music player, WiFi-capable digital camera, and even laptop PC does not have a Giteki mark, and you’re turning on your cellular (mobile) data, WiFi and/or Bluetooth, you’re violating the Japanese law of Radio Act. * The only exception allowed under the law is that you can use ONLY the cellular radio with your non-Japanese cellphone if you use your country’s SIM in it and use your country’s carrier’s international roaming service in Japan. But, no WiFi and no Bluetooth! Ok, I scared you, right? This law is very controversial, is too old, and does not fit with the current technological AND global world we live in. To be fair with the Japanese government, the law was initially established to avoid the radio interferences caused by radio broadcasting devices or walkie-talkie type of devices, which uses different frequencies in Japan from those overseas. The current Radio Act of Japan did not assume that there would be radio applications (frequencies) with global standards, such as WiFi and Bluetooth and, to certain degree, cellphone radio. I see some movements or desires to change this law or, at least, to include the exceptions to foreign travelers before 2020 Tokyo Olympics, to which Japan expects many international travelers. But, right now, it is not legal for you to turn on your device’s WiFi or Bluetooth in Japan unless the device contains a Giteki mark. On the other hand, it is practically impossible to find out if you’re using a consumer electronics device without a Giteki mark by only checking the radio frequencies and strength. There’s no difference between WiFi signals in Japan and WiFi signals elsewhere. The same goes to Bluetooth. So, the chances are you’re NOT going to be caught as an illegal radio-wave pollution generator. And, I’ve never heard of any international travelers get caught, prosecuted or penalized by using a WiFi in Japan through his cellphone or laptop computer. Hopefully, the law will change, or, at least, include the exceptions clause in the future. But, at this moment, please be responsible and discretionally to use your own non-Japanese electronics in Japan. Much to my surprise, my wife’s old Google Nexus 4 comes with the JP certification mark. I like the size of it, not too small, not too large. But, Google’s Lollypop upgrade almost destroyed it, and it took me a lot of time to fix it. SIEMIC Labs in Milpitas (Silicon Valley) California is recognized conformity Assessment body to perform Giteki certification testing, visit http://www.siemic.com for more information. I feel it is very funny when people say that someone is over-controlled in China and that Japan has freedom. In my opinion Japan in a dictatorship of the big phone companies that dont allow the consumers to take the decision they want. IIn Japan this problem was slightly alleviated. When bringing overseas mobile phones to Japan, overseas travelers will be temporarily exempted from that law. It’s only for a short time. If you live in Japan for a long time, you need to have a mobile phone that conforms to Japanese radio laws. I hope Japan will be able to use marks common to the world as soon as possible! The exempted time Taka wrote about is 90 days or less per stay in Japan. So RF emissions from foreign devices are not an interference problem for the first 90 days, but then magically become problematical? Interesting physics there. Or perhaps this is simply protectionism?